Ouarzazate is relatively small (~60 000 habitants) and, for Morocco, a quiet town, built mostly along the main street - Avenue Muhammed V. Ouarzazate is situated at an elevation of 1,135 metres. Its name comes from a Berber phrase meaning "without noise" or "without confusion". In the past, Ouarzazate was a crossroad for African traders seeking to reach northern cities in Morocco and Europe. 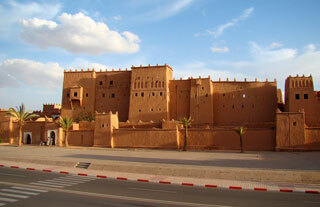 During the French period, Ouarzazate expanded considerably as a garrison town and administrative centre. It is the largest town in the Moroccan Sahara. This article uses material from the Wikipedia article "Ouarzazate", which is released under the Creative Commons Attribution-Share-Alike 3.0 License.